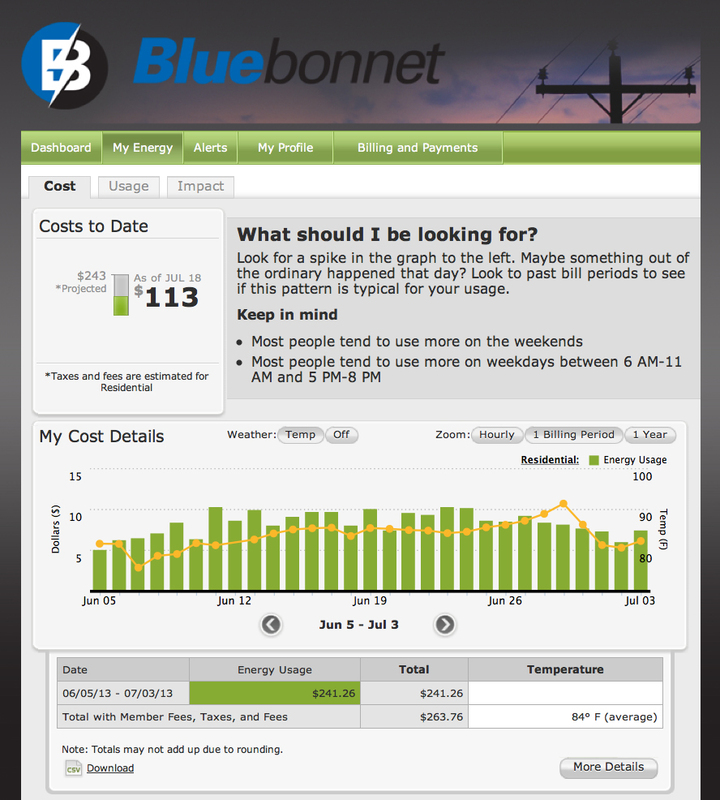 Bluebonnet Electric Cooperative’s members can now see on our website how weather directly impacts their energy use and electric bills. Bluebonnet recently introduced a new feature to its website: a line graph that overlays its members’ cost, usage and environmental impact charts. Weather is the single biggest factor in how much energy homes and most businesses use, especially during hot, summer months. This new temperature display on our website will show that when temperatures rise, so do electric bills. It’s another powerful piece of information our members have with the click of a mouse that they can use to control, and potentially lower, their electric bills. August and September are typically Texas’ hottest months, when consumers’ electric bills are highest. Seeing and knowing how those temperatures affect their electric bills empowers consumers to make small adjustments to the thermostats in their homes or businesses, which can lead to substantial savings on their electric bills. To see the temperature line graph, our members start by logging in to their account at bluebonnetelectric.coop. From there they can click on the details button on the “dashboard” to see bar charts of their costs to date, electric usage and environmental impact. A click of the “Temp” button above any of the bar charts places the temperature line graph atop a member’s hourly, daily or billing period data to allow easy comparison between the heat and energy use or costs. Members who have not created an online account can go to bluebonnetelectric.coop and click on the sign-up link under My Account in the upper right hand corner of the homepage. It’s a quick, easy and secure way to get important account information, as well as sign up for online bill pay and paperless billing. Increasing electric bill amount was a pain but this article proved to be useful.